If there’s one thing people complain about, over and over, it’s that figuring out how to really use DNA testing in genealogy is hard. The Legal Genealogist agrees 100%. And thank heavens there are folks out there who are trying to make it easier. Let me highlight three for you today who are trying to show us — visually — how to make the best use we can of our DNA results. 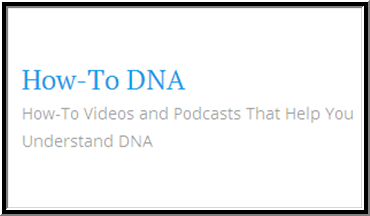 First off, there’s a new website that’s just been launched by Blaine Bettinger, who blogs as The Genetic Genealogist, called How-To DNA, described as a how-to guide for genetic genealogy. Upcoming topics include things like interpreting DNA results, using a chromosome browser and using free third-party tools like GEDmatch. There isn’t much available anywhere online about genetic genealogy that can hold a candle to the free webinar lineup offered by Family Tree DNA. This ongoing series already has a stunning archive on topics ranging from an introduction to Family Tree DNA itself to managing an FTDNA surname, geographic or haplogroup project. For those who’ve tested with AncestryDNA, there’s a whole set of Youtube videos covering the testing there. I always point beginners to Kelly Wheaton’s wonderful tutorials. They are the best and most comprehensive treatment of a very difficult subject I have seen. And her links at the end of the tutorials are excellent too. Kelly’s materials are excellent, and I’ve referred to them before. Today’s post focused on videos in particular. Thank you so much for the mention Judy! How To DNA has already been an absolute blast to build and work with! Looking forward to a lot of great content as the site continues to grow, Blaine!